We waste food – a lot of it. As much as half of the world’s food never makes it to people’s plates. It ends up in landfills instead, where it decomposes and creates methane, a greenhouse gas 20 times more potent than carbon dioxide. An innovative project in Junction City, OR has a solution to this problem: JC-Biomethane (JcBio) transforms food waste into renewable energy and products that return carbon and other nutrients to the soil. Beginning operations in 2013, JcBio became the Pacific Northwest’s first commercial food waste-to-electricity plant. The plant’s anaerobic digester ferments 20,000 tons a year of organic materials, primarily post-consumer, commercial food waste to produce methane-rich biogas, heat, and solids. The digester separates the biogas from the solid materials, and wrings the liquid from the solids to create two valuable products: clean, dry fiber used to make compost, and liquid fertilizer. The developers of JcBio have figured out how to address one of the key barriers that waste-to-energy plants face–the high cost of transporting organic waste from source to end use. JcBio shares a site with Lane Forest Products, which delivers landscaping products to the Portland area and takes advantage of the empty truck on the return trip to bring food waste to the plant to use as feedstock. Making use of this “backhaul” saves both companies money. Lane Forest Products also purchases the plant’s co-products – fiber for its composting operation, and liquid fertilizer that is applied to adjacent agricultural fields. JcBio is demonstrating one successful pathway to a low carbon future. 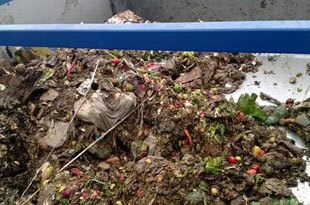 By keeping food out of the landfill, the plant prevents the release of harmful methane. The Climate Trust, which is purchasing carbon credits from the project, estimates that by capturing methane (landfills are the third largest source of methane in the nation), the project avoids releasing the equivalent of 10,000 metric tons of CO2 emissions each year, the same impact as removing 2,000 cars from the road. The project also replaces fossil fuel-based energy with renewable energy. According to the EPA, if half of the food waste in the U.S. were processed by digesters, the electricity produced could power 2.5 million homes. Partly in response to incentives from California’s Low Carbon Fuel Standard and the federal Renewable Fuel Standard, project owners are also exploring the potential to compress the gas to use as transportation fuel, considered an optimal use of biomass, given that fewer non-petroleum alternatives exist for liquid fuels than for electricity. Not only is JcBio reducing greenhouse gas emissions that exacerbate climate change, the fiber solids it produces are used to make compost that can help soils absorb some of the carbon pollution that is already in the atmosphere. Soils are the largest terrestrial carbon sink on earth, but modern agriculture and land use practices release carbon from the soil into the atmosphere. Adding compost to soil increases plant production and soil carbon sequestration, while also helping soils retain moisture and ward off pests and disease, crucially important in adapting to rising temperatures and drought from climate change. The liquid fertilizer coming out of the plant adds nutrients to soil, while replacing costly petroleum-derived fertilizer that releases nitrous oxide into the atmosphere, a greenhouse gas that is 300 times more effective at trapping heat in the atmosphere than carbon dioxide. JcBio epitomizes the emerging ‘bioeconomy’ espoused by the Northwest Biocarbon Initiative – transforming waste into useful products that can help sequester carbon naturally, while turning disposal costs and pollution problems into revenue streams. We have a huge opportunity to add what are now wastes back into the carbon cycle, restoring nature’s recycling system. Replacing imported, fossil fuel energy with energy generated from local waste products creates new business sectors and non-exportable jobs, resulting in more money circulating in our local economy. Imagine the fate of the leftover broccoli on your kid’s dinner plate at your favorite restaurant–instead of being dumped into the garbage, it is scraped into a compost bin and transformed into clean energy and valuable products. Jenna is a former staff member at Climate Solutions, where she provided the Strategic Innovation team with research on and analysis of the pathways to a low carbon future. She also coordinated Climate Solutions' Knowledge Management. Jenna’s career spans 18 years in the environmental field, with extensive experience leading collaborative efforts, as well as creating and advocating for public policy. She hails from California and received her BA in Environmental Sciences with an emphasis on Natural Resources Management from UC Santa Barbara in 1994. After working as a land use policy planner for Santa Barbara County and as the Community Affairs Director for the Environmental Defense Center in CA, Jenna headed north to the University of Oregon, where she attained an MS in Environmental Studies & Graduate Certificate in Not-for-Profit Management in 2006. After graduate school, she directed stewardship and outreach activities for an Oregon watershed council, and worked to advance sustainable building practices for the City of Eugene, where she developed and managed the City's Green Building Incentive Program. When not working, she likes to play outside, listen to live music, and explore new places.